Shame on the United States Senate and the Hypocritical PEP's!!!!! Identification with racists like Roseanne Barr who said “settlers are the pioneers at the forefront of the State of Israel” and compared BDS to a Nazi boycott of Jewish businesses: while in Jerusalem she was accompanied by Culture Minister Miri Regev whose admiration for Barr was on open display. The two also share the trait of being racist loudmouths: Regev has called African refugees a “cancer” and openly stated that she is “happy to be a fascist”. Were you watching Lawrence O’Donnell the night of September 9, 2016? Donald Trump had just said “If Iranian boats ‘make gestures’ at us, they’ll be “shot out of the water”. On his show that evening, Lawrence O’Donnell responded “(A) reasonable person would listen to that and say, no reasonable human being could ever mean that. The trouble is an unhinged mad man just said it into a microphone during his presidential campaign in public within the last two months of a campaign where the trying to convince the American voters that he should be the commander in chief. It’s in the week of the commander in chief forum and this unhinged lunatic says if people in their little boats make gestures to anyone on our destroyers, they will be shot out of the water thereby initiating an act of war against Iran. How do we know that this lunatic doesn’t mean every word of this? What about other Democratic politicians, not senators? Here is a headline from yesterday’s Boston Globe. Prominent Democrats Form Pro-Israel Group to Counter Skepticism on the Left . “Several prominent veteran Democrats, alarmed by the party’s drift from its long-standing alignment with Israel, are starting a new political group that will try to counter the rising skepticism on the left toward the Jewish state by supporting lawmakers and candidates in 2020 who stand unwaveringly with the country. With polls showing that liberals and younger voters are increasingly less sympathetic to Israel, and a handful of vocal supporters of Palestinian rights arriving in Congress, the new group — the Democratic Majority for Israel — is planning to wage a campaign to remind elected officials about what they call the party’s shared values and interests with one of the United States’ strongest allies. “Most Democrats are strongly pro-Israel, and we want to keep it that way,” said Mark Mellman, the group’s president and a longtime Democratic pollster. “There are a few discordant voices, but we want to make sure that what’s a very small problem doesn’t metastasize into a bigger problem.” The group, whose board includes former Michigan Governor Jennifer Granholm and a former Clinton administration housing secretary, Henry Cisernos, will create a political action committee later this year and may engage in Democratic primaries, Mellman said. “A few discordant voices”? Is he referring to the 22 Democratic United States Senators? I have a great deal of respect for Jennifer Granholm. When I was the Public Interest Adviser at Harvard Law School, Jennifer was one of the students who would always make herself available to sit on panels I put together to encourage other students to pursue careers in public interest and public service. This week I emailed her material referring to my support for BDS and including the news article about the murder of a Palestinian by a Jewish Israeli “squatter” (illegal resident) and a link to the Michelle Alexander article with a request that she reconsider her decision to sit on that board. With that in mind, if you care, good luck to your team, whether it’s the Los Angeles Rams or, as a close friend calls them, the New England Trumpettes. Just hours after Israeli Defense Minister Avigdor Lieberman warned that Israel is gearing up to launch a "large and painful military operation" in Gaza that would rival Operation Protective Edge—a 2014 assault that killed more than 2,000 Palestinians—the Israeli military carried out "wide-scale" airstrikes and deployed tanks against “militant sites across Gaza on Friday following weekly anti-occupation protests along the border fence”. That is what it says. Gazans continued to release incendiary kites and balloons from Gaza into Israel, which were said to have set “off damaging fires to farmlands”. You heard it right. Israel carried out wide-ranging airstrikes and deployed tanks against (so it is said) “militant sites” because Palestinians, during their ongoing protest against intolerable living conditions had resorted to releasing incendiary kites and balloons. Let me repeat that. Israel carried out wide-ranging airstrikes and deployed tanks against (so it is said) “militant sites” because Palestinians, during their ongoing protest against intolerable living conditions had resorted to releasing incendiary kites and balloons. For some, this picture (by Carlin) is worth many articles describing the ongoing massacre of Palestinians in Gaza. First, Israel converts de facto apartheid into de jure apartheid by enacting the Nation-State law. Then it continues to massacre, and make life intolerable for, Palestinians in order to effect ethnic cleansing in the West Bank, Gaza and in Israel. Israel’s end-game for decades, its only goal, is, not a just peace or two-states but a West Bank with no Palestinians that can be annexed legally to Israel. Yes. He called on “both sides” to step back. You can be certain that his “whining” will be totally ineffective in pressuring Israel to end its 40 year brutal oppression. Then there is the role of the United States in supporting the ongoing decade of massacres in Gaza. Kushner’s op-ed, the kind of truly fake news the MSM spews in the United States, is another example of the Israel propaganda campaign exposed in Occupation of the American Mind. Israel’s brutal oppression began when …… 1948?, 1967? Here are excerpts from Wikipedia on Hamas and the First Intifada. Hamas was founded in 1987, soon after the First Intifada broke out. The First Intifada or First Palestinian Intifada was a Palestinian uprising against the Israeli occupation of the West Bank and Gaza. The uprising lasted from December 1987 until the Madrid Conference in 1991, though some date its conclusion to 1993, with the signing of the Oslo Accords. The uprising began on 9 December, in the Jabalia refugee camp after an Israeli Defense Forces' (IDF) truck collided with a civilian car, killing four Palestinians. In the wake of the incident, a protest movement arose, involving a two-fold strategy of resistance and civil disobedience, consisting of general strikes, boycotts of Israeli Civil Administration institutions in the Gaza Strip and the West Bank, an economic boycott consisting of refusal to work in Israeli settlements on Israeli products, refusal to pay taxes, refusal to drive Palestinian cars with Israeli licenses, graffiti, barricading, and widespread throwing of stones and Molotov cocktails at the IDF and its infrastructure within the West Bank and Gaza Strip. 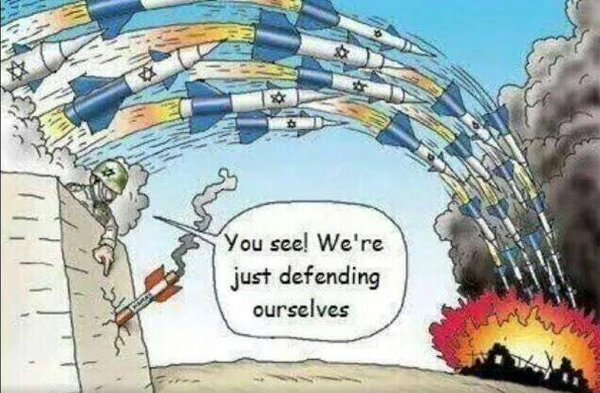 Israel, deploying some 80,000 soldiers and initially firing live rounds, killed a large number of Palestinians. In the first 13 months, 332 Palestinians and 12 Israelis were killed. Given the high proportion of children, youths and civilians killed, it then adopted a policy of 'might, power, and beatings,' namely "breaking Palestinians' bones". The global diffusion of images of soldiers beating adolescents with clubs then led to the adoption of firing semi-lethal plastic bullets. In the intifada's first year, Israeli security forces killed 311 Palestinians, of which 53 were under the age of 17. Over the first two years, according to Save the Children, an estimated 7% of all Palestinians under 18 years of age suffered injuries from shootings, beatings, or tear gas. Over six years the IDF killed an estimated 1,162–1,204 Palestinians. Between 23,600–29,900 Palestinian children required medical treatment from IDF beatings in the first 2 years. So, Israel was, in a way, the founder of Hamas. And a few years earlier, Israel similarly founded Hezbollah, a consequence of Israel’s invasion of, and massacres in, Lebanon. With all that in mind, it is inconceivable to me that anyone concerned with peace and justice would oppose the non-violent BDS movement. Strong global action is required and needed to end Israel’s massacres, to end its occupations, to close its settlements and to establish one democratic state with equal rights for all. I find it difficult to put into a few words the contempt I have for Donald Trump and Israel’s “Prince of Darkness”, or, as I referred to him recently, “Net and Yahoo”. The words, corrupt, immoral, unjust, venal and barbaric just don’t capture their essence. I have read a number of excellent articles that attempt to condemn them. But, as I mentioned in a previous email, I was, and have finished, reading 1984 by George Orwell. This book, published in 1949, is a remarkable warning to us today. feeling there is still time, and by responding with greater clarity and greater courage. Here are excerpts from the book and an excerpt from the Afterword by Erich Fromm published in 1981. “If there was hope, it must lie in the proles, because only there, in those swarming disregarded masses, eighty-five per cent of the population of Oceania, could the force to destroy the Party ever be generated. “It was not desirable that the proles should have strong political feelings. All that was required of them was a primitive patriotism .. and even when they became discontented, as they sometimes did, their discontent led nowhere, because, being without general ideas, they could only focus it on petty specific grievances. The larger evil invariably escaped their notice. “DOUBLETHINK means the power of holding two contradictory beliefs in one's mind simultaneously, and accepting both of them. The Party intellectual knows in which direction his memories must be altered; he therefore knows that he is playing tricks with reality; but by the exercise of DOUBLETHINK he also satisfies himself that reality is not violated. .. DOUBLETHINK lies at the very heart of Ingsoc, since the essential act of the Party is to use conscious deception while retaining the firmness of purpose that goes with complete honesty… “To tell deliberate lies while genuinely believing in them, to forget any fact that has become inconvenient, and then, when it becomes necessary again, to draw it back from oblivion for just so long as it is needed, to deny the existence of objective reality and all the while to take account of the reality which one denies — all this is indispensably necessary. Even in using the word DOUBLETHINK it is necessary to exercise DOUBLETHINK. For by using the word one admits that one is tampering with reality; by a fresh act of DOUBLETHINK one erases this knowledge; and so on indefinitely, with the lie always one leap ahead of the truth … “Whatever the Party holds to be the truth IS the truth. It is impossible to see reality except by looking through the eyes of the Party. We are witnessing a situation analogous to that described in 1984. We have Big Brothers here and in Israel. We have The Party – Republicans here and Likud there. We have an attempt to alter the truth in the United States with Donald Trump lying thousands of times and Republicans cravenly hiding their heads in the sand. In Israel we have Hasbara – lies after lies intended to (and in the past successful) convince unprincipled and doublethinking politicians (Republicans AND Democrats) in the United States that brutal Israeli oppressors are simply protecting themselves and that Palestinian women, children and men seeking to end the stamping on their faces are terrorists. Further, Israel’s 30 year Hasbara campaign (doublethink) is described in a powerful post Hasbara is Dead from Philip Weiss: “Hasbara has died. 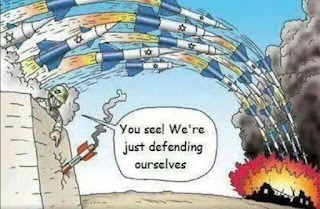 The Israeli effort to “explain” its actions to the world– that era is over. Israel has given up trying to explain itself to fair-minded people. Because the fair-minded have all made up their minds; the slaughter in Gaza has seen to that. And Israel doesn’t think they are fair anyway. No, its explanations are reserved now for the hard-core supporters. The hasbara is pure propaganda, aimed at rallying the base. And everyone else is tuning out.” This propaganda has been revealed and shredded in the movie Occupation of the American Mind which can be viewed free. In 1984 Winston is tortured as he is reeducated, learns the art of “doublethink” and finally believes that two plus two is 5. Reminds me of one of my favorite education songs that I used to play during the 1980’s for 1L’s at Harvard Law School in the six-session seminar I presented during their first three months before the law school began to funnel them to large law firms at high salaries so they could repay the law schools for the excessive cost to attend. The disservice law schools did to women students continues today as women are still encouraged to take BigLaw positions when the law schools have known for decades about the mistreatment and abuse that lies ahead for women. (To me this song written by Harry Chapin, Flowers are Red, is a vivid explanation of the defects in most elementary, post-high school and graduate education – learning how to be a lemming). Will we all soon believe that there were more people at Trump’s inauguration than in any other inauguration in history? Winston’s experience in Oceania makes Offred’s life in Gilead seem like Mary Poppins’ work as a nanny or Maria’s position working for the Von Trapp family. For what? Possibly the only solution. Last year, there was a movement for a National General Strike . Perhaps it was too soon in 2017. The organizers were prescient. They saw what was coming. To combat apartheid and oppression in Israel, support for the BDS movement is essential. Soon everyone will understand that the only solution that combines peace with justice is one democratic state with equal rights for all. "The only thing necessary for the triumph of evil is for good men (and women) to do nothing." - Edmund Burke. Tomorrow is my 100th birthday. The key to my home in the village of Marblehead, Massachusetts, hangs on my wall. I wonder who lives there now. Someday I hope that my descendants will again be able to return to my house and live there. Was it really just 19 years ago that the 2020 election was canceled? The then current United States President declared himself Czar Donald 1. Soon, thereafter, he appointed Pastor John Hagee as Minister of Racial Health. Every member of the Jewish community should have been alarmed knowing since Hagee has referred to Hitler as a half-breed Jewish descendant of Esau and says the disobedience of Jews to God gave rise to their persecution for centuries. Many of the leaders of the Jewish community were silent or urged caution knowing that Hagee was a huuuuge supporter of Israel (because the bible says that when Israel is invaded by Russians and Muslims, God will destroy them, the Messiah will return, those who believe in Jesus will be taken to heaven and those who don’t (me and my family) will be Left Behind as the world is destroyed in a global conflagration). Within weeks after Minister Hagee declared New England to be the White Anglo Christian Keystone Outpost (WACKO), Jewish organizations armed themselves and fought valiantly but were overcome by Hagee’s militia. The violence and brutality of his militia forced us to flee our homes, but we were able to take refuge in northern Maine where we were quickly surrounded. Soon thereafter with funding supplied by Mexico and equipment provided by Caterpillar, a wall was built and we were trapped. The area became known as the Aroostook Zionist Action Grant (AZAG) Strip. Soon thereafter we began to organize politically and militarily to fight against the Czar. With support, advice and guidance from Jimmy Carter, we held an election for delegates to the newly formed Hebrew Aid Members Armed Society (HAMAS) with Risay Tafara as our first president. Upon hearing that there was an attempt to establish a democracy within WACKO, Czar Donald 1 immediately imposed a blockade of the entire AZAG Strip. Within a few months we were no longer able to obtain sufficient water, electricity, food, medical supplies, building supplies or any other of the necessities of daily living. Despite our pleas to the UN and the EU, nothing happened to alleviate our plight. On top of that, the Czar had negotiated with the new Canadian Prime Minister, Unjustin Falsedoe, to extend the blockade along the Canadian border. While I was worried about throwing out my back, I worked with others in the “Marbleheaders” Unit to dig a tunnel into Saint-Pamphile in an attempt to find and bring back bread and eggs. Sadly, Hagee’s militia found the tunnel and destroyed it. We continued to fight back by building hurling potatoes over the wall but our resistance was met with attacks from helicopters, missiles, drones and armored vehicles. Unemployment reached 80%. Children were suffering from malnutrition. On rare occasions, some were able to exit through one of the checkpoints connecting us with WACKO. The process was time-consuming and humiliating. In some instances, pregnant women lost their children because of the time consumed trying to enter WACKO on their way to the Boston No Abortion Hospital Complex. We were also extremely upset when one our high school graduates with 1550 on her SAT’s and a full scholarship to Bowdoin College was not granted permission to leave AZAG. When she complained, two of the militia tore her from her parents and took her crying hysterically to a former brig in Portsmouth, Gilead, oops, I mean New Hampshire. Finally, in late 2038, with AZAG no longer being inhabitable, we had had enough. We called for a peaceful protest at the Danforth Checkpoint. All went well until someone catapulted strawberries causing a rash on the nose of one of Hagee’s militia. At that point Hagee’s militia began firing through the checkpoint fence, killing 30 and injuring 1400 men, women and children. A New York Times reporter, Christian White, interviewed members of Hagee’s militia and concluded they had acted in self-defense. Another reporter, Roland Hedley, formerly of Doonesbury reporter (see attached report from him) but now with Fox News, suggested there might be two sides to the story and that this might be a case of apartheid and possible ethnic cleansing but the NYT quickly reassigned him to Myanmar. Minister Hagee promised a full investigation. Czar Donald 1 applauded Hagee’s militia for their restraint and Hagee’s commitment to peace with justice. P.S. Please don’t try to send me a birthday card. Hagee prohibits all mail for fear that it might contain coded terror messages and won’t allow us to connect to Net and Yahoo.